(Phys.org) —Before the microwave gained fame as a kitchen wonder, there was the, gasp, refrigerator, a kitchen wonder that could freeze meat and keep ice cream from melting on top, while preserving the life of leftovers and milk, juice and eggs below. For Americans, GE became an entrenched brand name in owning the modern fridge. Now GE wants to write the second chapter in home refrigeration. This week GE announced its research focus on magnetic (magnetocaloric) refrigeration, which uses no refrigerants or compressors and is 20 percent more efficient than what is used today. The technique involves the use of a water-based fluid and magnets. Rotating magnets change the magnetic field back and forth and pump water-based cooling fluid between the cold side to the hot side. "This is a big deal," said Venkat Venkatakrishnan, a leader of the research team. "We are on the cusp of the next refrigeration revolution." GE said the technology could be at work inside the fridge by the end of the decade; the company expects to commercialize their magnetic refrigeration technology by 2020. One key benefit being touted is efficiency. In figuring out how to create the cold without chemical refrigerants or compression, Venkatakrishnan said the technology carries greater efficiency. Also, "because the technology does not contain traditional refrigerants, recycling refrigerators at end of life will be easier and less costly." Specifically, the system uses a water-based fluid rather than a chemical refrigerant such as Freon to transfer heat from inside the refrigerator and achieve the cooling process. In place of the compressor, magnets create a magnetic field, said a GE report, that "agitates particles in the fluid causing it to cool. The strength of the magnetic fields determines how cold the fluid becomes, and in turn, how quickly it cools the refrigerator." The team's materials scientists developed a type of nickel-manganese alloys for magnets that function at room temperatures. Engineers arranged the magnets in a series of 50 cooling stages. Today they are capable of reducing temperature by 80 degrees. The team aims to achieve a 100-degree drop in temperature at low power. 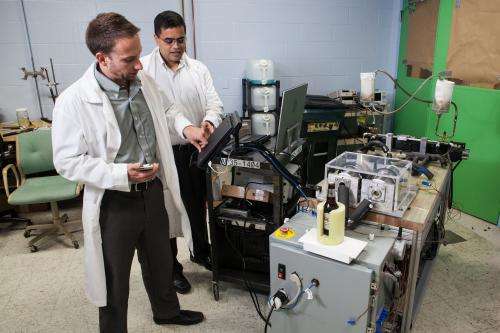 "We are focusing on magnetic refrigeration as a potential replacement for all the refrigeration technologies currently in use," said Michael Benedict, lead engineer for GE Appliances' magnetocaloric project. According to GE, the technology can be applied to other heat pump applications such as HVAC and has the potential to impact nearly 60 percent of the average US household's energy consumption. "magnets are used to create a magnetic field that agitates particles in the fluid causing it to cool"
hmm I thought that agitated particles have a higher temperature (like what can be seen in hot water on a stove top). Or are they here talking about canceling the particles agitation, slowing them down, and thus cooling them? Presumably the heat from the agitated particles would be transferred to the outside of the icebox, leading to a cooler ambient temperature inside the icebox (like a conventional fridge or air condition unit). "Cooltech has been trying to commercialize this technology since 2011. At the end of 2013, a production line was completed with a capacity of 10,000 units /year and the first assembled products." "At the end of 2013, Cooltech Applications announced that its first refrigeration equipment should be placed on the professional market for 2014." Should work for heating also. "In figuring out how to create the cold without chemical refrigerants or compression, Venkatakrishnan said the technology carries greater efficiency"
The convention is that you cannot "Create" cold? Rather remove heat. Based on this I find that Venkatakrishnan maybe confused as to how heat flows? Or am I behind the times? Half the small refridges in campers now use a compressorless design. Not new! And the camper style semiconductor designs do not use a chemical refrigerant gas OR liquid. Why not scale up those. AS it is, those water units will be unreliable in a cold climate subject to random power failures from a provider utility. The price of power loss will be permanent freeze damage to all such units as the refrigerant .....freezes and breaks the systems apart from within. Unless of course they want to 'contaminate' the water with ethanol....make it abusable by drinking; or contaminate it with 'other' solutes....make it poison hazards for kids; etc. Half the small refridges in campers now use a compressorless design. Not new! And the camper style semiconductor designs do not use a chemical refrigerant gas OR liquid. Why not scale up those. A compressor operated phase changing refridgerator has a coefficient of power around 4-5 and a solid state thermoelectric system has a coefficient of roughly 0.9-1.1 The CoP is the measure of how much heat is being removed per input power. The thermoelectric coolers cannot work over a large temperature difference, and their CoP diminishes to roughly zero with 70 C of difference, which in practice means you can hardly keep ice frozen if it's properly warm outside. The reason why campers come with such inefficient systems is because compressor based systems are more expensive and take up more room out of the box when miniaturized to operate at low power.